Wooden crates being screwed open, nails being tapped into freshly built walls, and gallery directors instructing installers are the sounds heard in the anxious days before art fairs open to VIPs and the public. Collectors, curators, and the culturally aware will soon be critiquing the works and sharing their views on social media. Art fairs—especially the heavily attended events promoted by Frieze and Art Basel—have become laboratories where it’s possible to measure taste preferences for different types of art by analyzing the Instagram posts of fairgoers. Instagram is a daily (okay, hourly) obsession for many art lovers. From Cindy Sherman’s selfies to Brett Gorvy’s stream of beautiful images, frequently accompanied by delicious insider gossip and music tracks, Instagram serves up endless visual images to half a billion people around the world who use it daily. These posts are a treasure trove of information that can be used to identify artworks that intrigue, shock, or inspire people. But rather than simply counting the number of “likes” an image receives, we believe a better measurement of a work’s impact is to assess how people react to art they viscerally connected with after seeing it in person. Toward that end, we have been aggregating Instagram posts by visitors to the world’s top art fairs, using these data to create refined measures of popularity that we can compare over time. Our first article on this topic analyzed posts from the 2017 edition of Art Basel in Miami Beach. This article is focused on results from the recent Frieze Week in London, and the June edition of Art Basel in Basel, Switzerland. There were noticeable differences between fairgoers’ favorites. 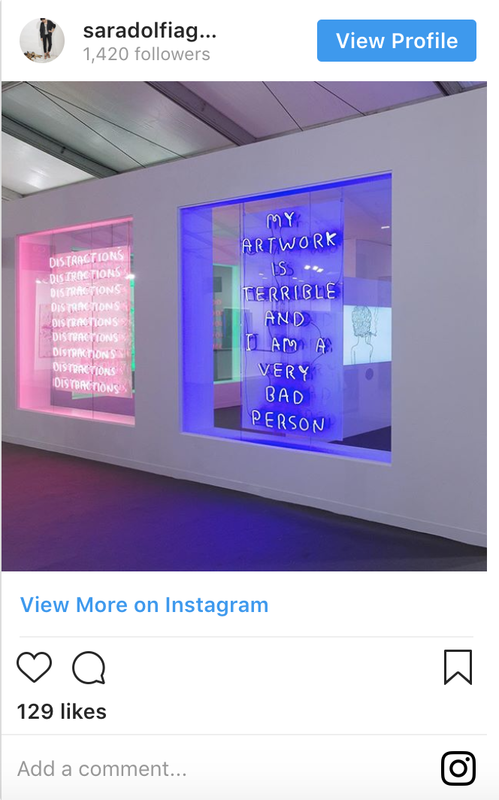 At Frieze, the 10 most Instagrammed works were by mid-career and older artists, who tended to eschew abstraction in favor of text-based or figurative work that could easily fit into a city-sized apartment or suburban home. These artists were almost evenly split between men and women, showcasing the rising role and importance of female artists. But at Art Basel, the most Instagrammed works tended to be huge, conceptually laden installations only suitable for purchase by extremely wealthy collectors with their own private exhibition spaces to fill, or perhaps an institution looking to provide visitors with an immersive experience. Exhibit 1: Instagram posts of Josh Kline, Dave/Journalist , 2016, at Stuart Shave/Modern Art booth at Frieze London. A quick note on methodology: We created a database of all Instagram posts made with geolocation and/or relevant hashtags indicating that the user attended Frieze Week in London this October, and a similar database for Art Basel in Basel. 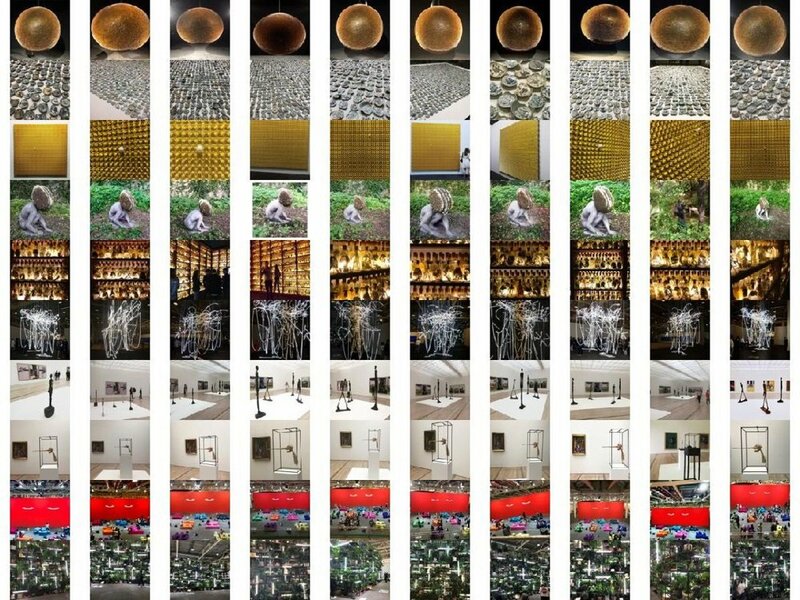 Eliminating selfies and other extraneous images yielded approximately 66,000 images, which we then ran through an artificial intelligence tool designed and optimized for art, to separate pictures of the same artwork into groups. This special tool was developed by Artrendex, a New York–based technology startup of which Ahmed Elgammal is founder and CEO. An example of how the algorithm classified different Instagram pictures as being the same artwork is shown in Exhibit 1. Once classified, we then ranked ordered artworks based on the number of Instagram posts they received, with each image posted counting as one vote. We believe this is more grounded in the actual art-viewing experience than “like”-based measures, in which a post by Paris Hilton from Art Basel could receive thousands of “likes” from people who never saw the art. Exhibit 2: David Shrigley, My Artwork (blue), 2018. Courtesy of the artist and Stephen Friedman Gallery. Frieze London, the fair devoted to contemporary art, and Frieze Masters, which includes art from ancient times to the late 20th century, reported record attendance this year. The most Instagrammed work across both fairs was by David Shrigley, the Turner Prize–nominated artist best known for his sardonic works that riff on life’s absurdities. At Frieze London, his mock shopfront with large-scale neon panels, a two-screen digital animation, a sound piece, and a series of works on paper drew fairgoers with its colorful neon signs of deadpan messages rendered in the artist’s handwriting. His most popular sign in the group crisply stated in blue neon “MY ARTWORK IS TERRIBLE AND I AM A VERY BAD PERSON”—a charming statement of self-deprecation in the middle of the fair! Like Shrigley, three other artists on the top 10 list created text-based art: Tracey Emin with a neon piece, Jeppe Hein with handwritten messages on a two-way mirror, and Tim Etchells with an outdoor sculpture that spelled out the title of the piece (Everything Is Lost, 2018) in metal letters. The literalness of these artworks, which avoid metaphor or embellishment, may be what made them so appealing to Frieze fairgoers. Similarly, abstraction was in short supply among the top 10 images, except for a stunning piece by Rana Begum that played with seriality, color, and perception. Fairgoers seemed to prefer artworks with specific and seemingly known intent over works with illusive meaning. Additionally—with the exception of the second-most-popular work, a large-scale installation by Tatiana Trouvé comprised of a large bronze tree trunk, a water element, and concrete slabs—all of the top 10 Frieze artworks could be reasonably installed in someone’s home—a feature of the fair at large, which was lamented by some. The “houseability” of the art was in sharp contrast to the most Instagrammed works from Art Basel. Lastly, social justice is a frequent theme of artistic production and art criticism. 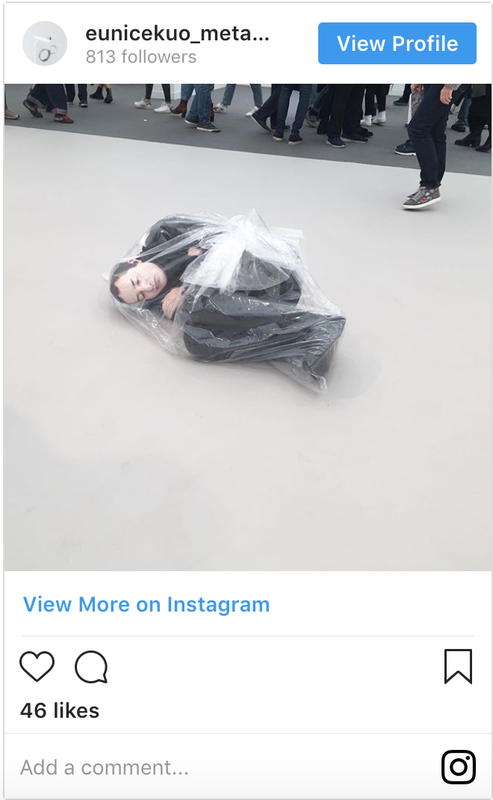 Yet works exploring it were largely absent from the list of Frieze’s 10 most Instagrammed artworks, with the possible exception of a sculpture by Josh Kline featuring a curled-up mannequin lying on the floor in a plastic bag, entitled Dave/Journalist (2016). Fairgoers may have wanted a respite from the world at large, or found the social justice–inspired works at the fair not compelling enough to share with friends. Exhibit 3: Top 10 Instagrammed artworks during Frieze Week, 2018. Nearly 95,000 visitors attended the most recent incarnation of Art Basel in Basel—an extraordinary figure, given that the town only has 170,000 inhabitants. Widely viewed as the most important fair in the world, it offers attendees a standard art fair experience of gallery booths in a conference center, plus an exhibition of gargantuan artworks in the fair’s Unlimited sector. This part of the fair is a showcase for the unlimited ambition of artists, both living and deceased, who play with scale, motion, sound, and/or group experiences; it is a high-end shopping bazaar for those with the means and desire to own fantastical and outsized objects. Museum directors and trustees are often seen prowling Unlimited in pursuit of immersive, Instagram-worthy pieces and installations that, if acquired, could draw audiences to their institutions. Exhibit 4: Instagram post of Robert Longo, Death Star II, 2017–18. Courtesy of Metro Pictures and Galerie Thaddaeus Ropac at Art Basel Unlimited. Eight of the 10 most Instagrammed works at Art Basel this year were from Unlimited. The most Instagrammed work was a sculpture by Robert Longo of a mysterious orb, nearly 6-and-a-half feet in diameter, suspended in a darkened room; it was comprised of 40,000 bullets, which approximates the number of people killed annually by guns in the United States. To support efforts to reduce gun violence, the artist announced that 20 percent of the proceeds from the sale of the sculpture would be donated to Everytown for Gun Safety. The exceptions were Alberto Giacometti sculptures exhibited at Fondation Beyeler, as part of a blockbuster show devoted to him and Francis Bacon. No works from the main fair made the top 10 list. Instagram posts provide a rich source of data that can be used to identify art that inspires and intrigues people. While these data come with potential biases, including overrepresentation by heavy social media users and a tilt toward younger audiences, they provide a new way to pinpoint the type of art that moves audiences and inspires people to share their inspiration. *A version of this article appeared in Artsy Magazine on December 4, 2018. Click here to be taken to the Artsy website.